You can choose any of the following features to enhance any of the above packages or build your own custom package. The prices for each event will be based on the event details as discussed during booking, a $1,500 booking fee will be required for all a la carte events. Join the BCACSB for our 2nd Annual Brazilian Cultural Camping Encounter at Camp Comfort in Ojai, CA! Didn't get a chance to purchase your tickets early? Not a problem! Tickets will be available for purchase at the door! Call (805) 259-8318 with any questions. 2016 WHITE & GOLD BRAZILIAN NEW YEARS EVE PARTY!! Join the Brazilian Cultural Arts Center of Santa Barbara on New Year's Eve (Thursday Dec 31st) from 9pm -1am for our premier 2016 White & Gold Brazilian New Years Eve Party! Come to experience a Brazilian New Years event and ring in 2016 with your loved ones while dancing and enjoying great performances and live music! This event is for all ages so please bring your family and friends! There will be a full performance with live music, fancy feathered Samba dancers, Capoeira performers and more followed by a live performance from Santa Barbara’s hottest Brazilian Band Prakantar with Mariano Silva! Purchasing tickets in advance is highly encouraged to secure your space at this show that will sell out. For more information and to purchase your tickets today visit www.dance805.com or call Stephanie at 805-259-8318. Brazilian Food for purchase and full bar + midnight champagne toast! Welcome to the 3rd Annual Brazilian Day Santa Barbara Celebration & Capoeira Cultural Encounter! This year we have expanded the celebration to a full week of activities including many free community events for all ages to celebrate the Brazilian Cultural Arts. We will be hosting master classes with renowned guests from across the country to enhance our community. Our special Capoeira guests will include Mestres Urubu, Palmares, Batata, Paulo Batuta, Contra-Mestres Muito Tempo, Xingu, Versatil, Chin, Professors Corpo Fechado, Pezao and others! Enjoy African Brazilian Dance, Afro-Samba, African Dance, Afro-Cuban Drumming & Afro-Brazilian Percussion workshops with additional special guests Nadra, Julie Simon, Wagner and Miguelito. Workshops and events will be happening throughout the City of Santa Barbara highlighting its extraordinary hospitality and dedication to supporting the arts. Join us Saturday night for our premiere Brazilian Festival at SOhO Restaurant & Music Club starting at 10PM. The entry fee will include a full performance with live music, feathered Samba dancers, Capoeira performers and more followed by alive performance from Santa Barbara’s hottest Brazilian Band Prakantar with Mariano Silva! Join the Brazilian Cultural Arts Center of Santa Barbara for a weekend of fun at the 2015 Santa Barbara Batizado & Solstice Carnaval Celebration with Mariano Silva. Kick off the Holidays with a special performance and show presented by the Brazilian Cultural Arts Center of Santa Barbara! Only $10 per person! Enjoy live music from local favorite, Prakantar Band, and breathtaking pieces from the BahiaMagia Dance Company featuring Capoeira, Afro-Brazilian Dance, Orixa Dances, Maculele and more! Brazilian cuisine and drink will be available for purchase. Join the Brazilian Cultural Arts Center of Santa Barbara for the 1st Annual Brazilian Cultural Camping Encounter on Saturday November 22nd and 23rd! The event will be held at the Carpinteria State Beach Campgrounds just steps away from the beach! Notes: Must bring your own tent and camping gear. Parking fees are not included. Due to the limited space available preregistration is required. Join the Brazilian Cultural Arts Center of Santa Barbara in celebrating the rich Brazilian culture in our community during the 2nd Annual Brazilian Day Santa Barbara festivities! We will be hosting workshops in the morning featuring instructors Julie Simon, Master Mariano Silva and special guest drumming and Capoeira instructors! We will follow the workshops with a FREE event at Tonic Nightclub (21+) featuring live Brazilian Bands, Batucada, Dance Performances and more! Featuring: Samba, Afro-Brazilian Dance, Batucada and Capoeira! Performances by: Tropicaleiza Dance Company, Samba Dancers and Capoeira with Mestre Mariano! We hope you will join us! Please contact Stephanie with any questions regarding the Brazilian Day Santa Barbara celebration: (805) 259-8318 or by emailing marianosbdance@yahoo.com. Open House this Thursday September 18th! 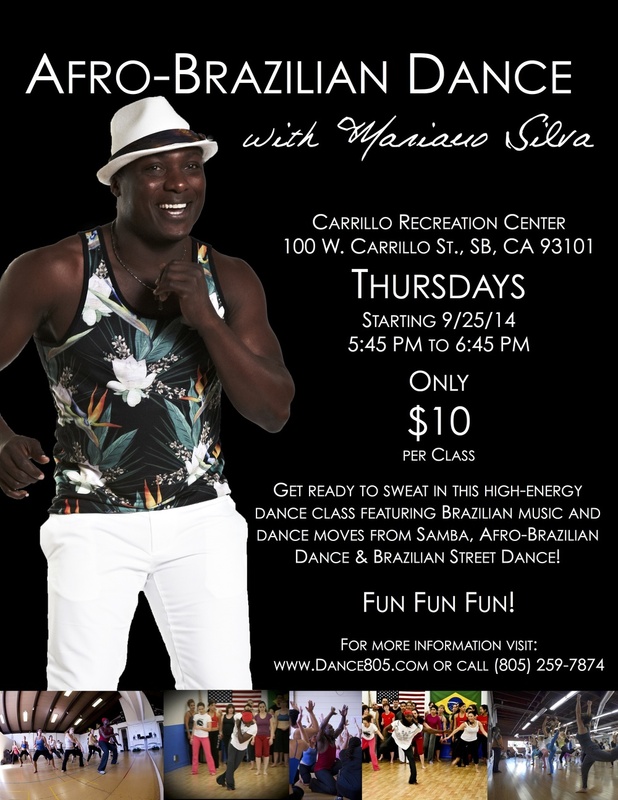 Join Mariano Silva for Afro-Brazilian Dance at the Carrillo Recreation Center in the heart of Downtown Santa Barbara! This is the start of something great for the Santa Barbara Community! We invite friends and family to join us for this exhilarating dance experience. Only $10. Open to all ages. This year we will be Honoring Women Throughout History and Our Future! Get your costume and have fun with your friends and family dancing, drumming or enjoying the music in the most fun group in the Solstice Parade. CAPOEIRA BATUQUE SANTA BARBARA 13TH ANNUAL BATIZADO AND BRAZILIAN CARNAVAL PARADE 2014! We are honored to invite the whole Capoeira and Dance community to come and be a part of this amazing event Honoring Women Throughout History & Our Future! We are having our traditional street Carnaval on Saturday June 21st but don’t forget our Pre-Carnaval Show at Wildcat as we kick off the festivities on Friday June 20th! Also, this year we are proud to welcome the best dance Masters in the nation to share their knowledge with the community, featuring: Julie Simon, Jonia McClenney, Ana Laidley, Rachel Hernandez, Irini, Rebecca, Gisella Ferreira and more! Workshops: Samba, Afro-Contemporary, Orixas Dance, Afro-Samba, Afro-Brazilian Dance, Capoeira and more. On Sunday June 22nd, we are celebrating our Annual Capoeira Batizado and Encounter! Purchase your tickets online for pick up at the door or call (805) 259-8318.